The project, which was funded by a Heritage Lottery award, involved the group researching and recording the story of the people on the estate at various historical periods. To document the project we have produced a booklet highlighting many aspects of the research. We held a very successful celebration of the end of our Wimpole project over the weekend of 25th/26th January. This was held in the Marshall Room at the restaurant at Wimpole Hall, where we displayed posters of the results of all the aspects of the project, together with some of the pottery, metal work and other finds. The poster display then went to the Cambridge Central Library, outside the Local Studies Library a week. Most recently, we displayed the posters at the CAS Conference on 22nd February, where they got considerable interest, as the theme of the conference was new approaches to landscape archaeology. Wed 28th August. We were very pleased to deliver all the pottery from our work at Wimpole to Paul Blinkhorn for identification, a big step forward in our HLF funded project. 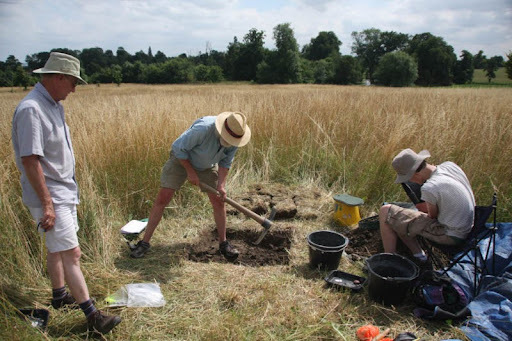 We already have some preliminary results back with Iron Age, Roman Saxon and Medieval pot in some of the fieldwalking - hopefully there will be interesting results from the test pits which were such hard going to dig in the heat of late July. Well we dug 15 test pits in heavy clay and at the hottest time of the year, 33C on the third day. The deepest test pit went down 1m, a lot of earth to shift, and it was packed with medieval pottery all the way. In all the test pits together there were 517 sherd of pottery weighing 2.8 Kg, 813 pieces of brick weighing 18 Kg, 740 bones weighing 2.6 Kg, plus amongst other finds a piece of barbed wire and the end of a shotgun cartridge. The pottery will now be sent for detailed identification along with pottery from previous excavations and fieldwalking – we hope this will give us dates ranging from Roman to the 18th century. Rather surprisingly our test pits have not produced much 18th and later pottery nearly all of it looks to be 11th to 15th century but our expert might well tell us a different story. After a long hot week, the test pitting has now finished. A summary of the week will be posted shortly, but just to say thanks to all those involved and to all our visitors, who showed so much interest in our project. Test pits 13 and 14 under way producing medieval and Roman pottery. The CAFG team were slowing up after lunch as the temperature hit 28 deg and the ground seems to get harder and harder. Still very hot for excavating and the heavy clay soil makes it even more difficult, but we are making real progress with fifteen test pits of which ten have been completed. 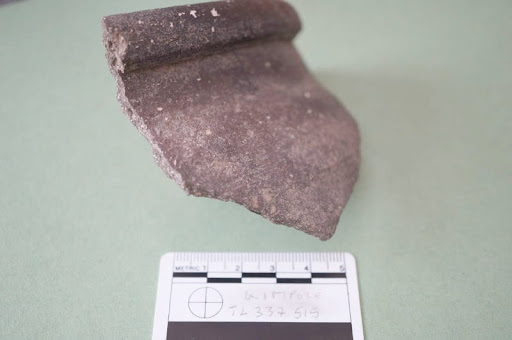 There may be one or two pieces of Roman pottery and one test pit has produced what might be early Saxon pot, we will await Paul Blinkhorn's opinion on these. Another test pit which we hoped to complete yesterday has gone on down to 1m depth still producing medieval pottery and animal bone. Twelve test pits with eight finished, one produced barbed wire 400mm down so we abandoned that one. 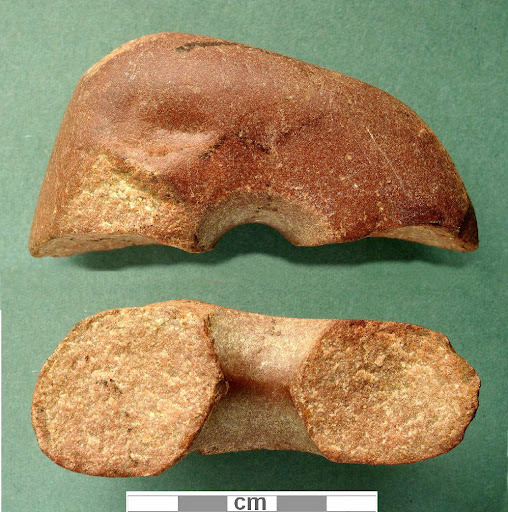 Others have are producing medieval pottery, some of which looks quite early, one test pit is down to 700mm with medieval pottery, and there is still an almost complete absence of 16th and 17th century pottery. With three days to go we hope to complete a few more yet. Another really hot day, not really good weather for digging. We now have eleven Test Pits of which six have been completed. This morning we moved onto the field below the Folly where fieldwalking in the 1980's produced early Saxon pottery, so far the ground is very hard and dry and not giving us much in the way of pottery. The only light relief are large groups of wild geese grazing the grass around us. The heat has almost finished the team, the ground is rock hard but we are enjoying ourselves. 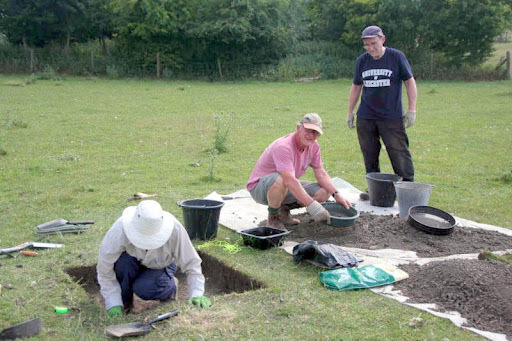 Three test pits completed one with 12th - 13th century pottery. Of those now open, one with a mass of stones and mortar, possibly a floor and wall, and three with promising dark soil. We had expected to see a lot more 17th century pottery but as yet a very few sherds. We will be test pitting in the park at Wimpole Hall from the 20th to the 28th July with local people and other volunteers. Most of the test pits will be on sites where houses are shown on a map of 1638, to try to find dating evidence for the years they were occupied. Others will be in a field where finds from fieldwalking suggest earlier occupation. 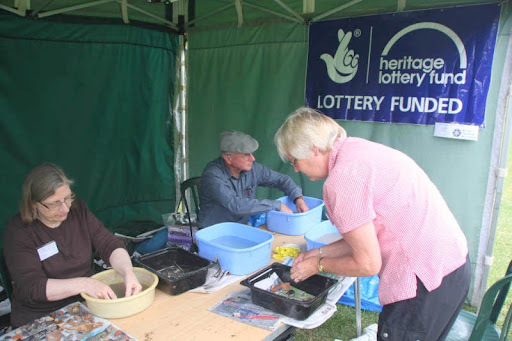 The pits will be open for public view and we will also have a tent in the formal gardens, where finds will be washed and displayed and members will be available to explain the project. 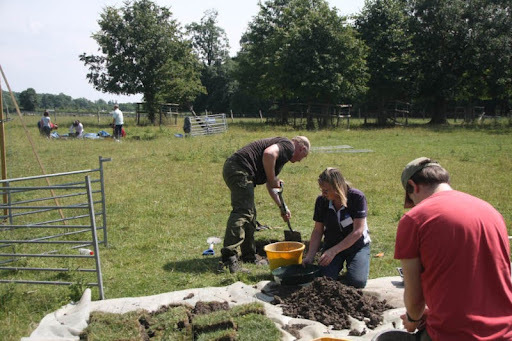 This is part of the HLF funded project and also part of the Council for British Archaeology Festival of Archaeology. As part of our Heritage Lottery Grant application, CAFG is committed to widening the scope of the group’s activities with the intention of helping our members acquire different skills. One of the activities chosen was geophysics (for more information on this technique see the article in our Articles section). 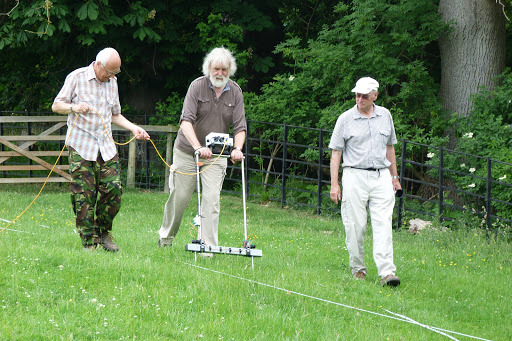 Following training with loan resistivity equipment, carried out by the Jigsaw Project team, members Terry Dymott and Robert Skeen undertook training of some members recently at the Wimpole Estate. This was followed by a real survey which was part of our All our Stories project. The area under investigation was a house site shown on the 1638 Hare Map to the south west of the Hall. More work will be carried out during our July 20th – 28th test pitting activities. 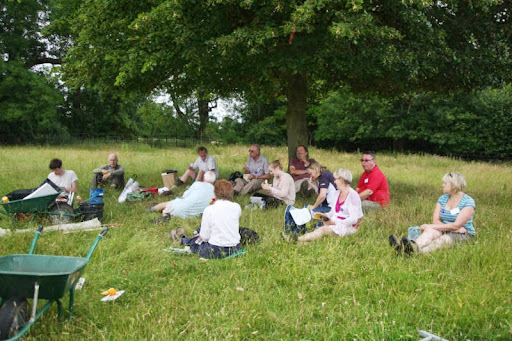 Since the beginning of the year, members of the Group have been busy with fieldwalking, metal detecting, resistivity surveying, finds processing and research (documents, maps, air photos, existing finds). We have also been holding monthly project planning meetings. This rim sherd of St Neots shell tempered pottery was found in a rabbit hole close to one of the sites where we will be test pitting. There should be plenty to find. All Our Stories, a brand new HLF small grant programme launched earlier this year in support of BBC Two’s The Great British Story, has been designed as an opportunity for everyone to get involved in learning about their heritage. 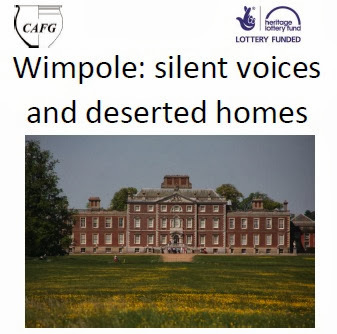 Entitled “Wimpole: silent voices and deserted homes” this exciting CAFG project is designed to use field archaeology and archive studies to investigate the landscape of Wimpole parish. 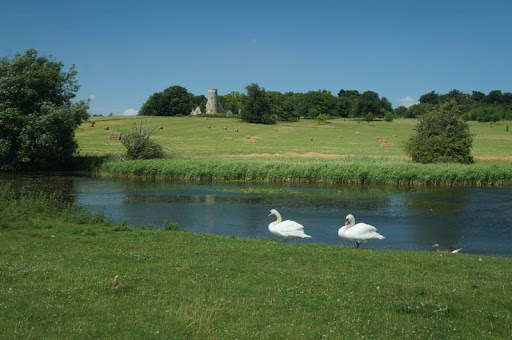 The current landscape is dominated by Wimpole Hall and its farm buildings but in the past there were other thriving communities in the area. Little documentary evidence exists relating to this part of our past. Our intention is to record the surviving archaeological evidence for the long-vanished settlements and their inhabitants in order to restore their place in our local history. Starting at the beginning of 2013, the project is supported by the Heritage Lottery Fund grant and will continue to receive support from Cambridge Community Heritage at the University of Cambridge and from the National Trust. Fieldwork started on 6th January and attracted a small team and fog.